Well designed, high quality calendars are a great benefit for promotion and branding. Not only are they functional for everyday use, but they help present an opportunity of exposure on a daily basis. 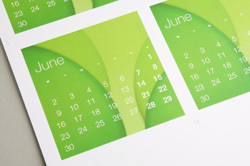 Calendar printing is one of our specialties. We utilize state-of-the-art equipment that provides customers with vibrant color and clear images. Calendars can be an exciting way to keep up with daily tasks. Make your impression every single day of the year. If you have a print-ready file, we can put full-color technologies and quality printing processes to work for you, ensuring your custom printed calendars come out vibrant and sharp.